When we're trying to influence someone, it's important that we understand how the message we're trying to convey is being received. The face of the other person will often reveal far more about what the other person thinks about our message than what they say. This research adds a new dimension to the belief that there are 'true' and 'false' smiles. Reward smiles communicate positive experiences or intentions. They are symmetrical and are accompanied by eyebrow raising. In this case our message, or at least an aspect of it, have landed well. 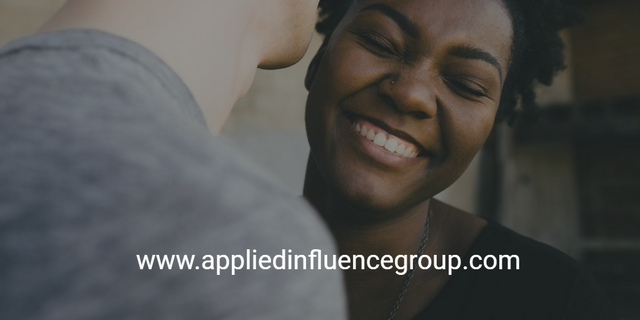 Affiliative smiles communicate approachability, appeasement or acknowledgement. They are a closed mouth smile with the lips pressed together. Here, our message may not be the one the other person fully wants to hear but the wry smile of acceptance may signify that they accept it's the right thing. Dominance smiles are asymmetrical and are often accompanied by nose wrinkling and raising of the upper lip. Unlike the other types of smile, these are linked with negative feelings. This may signify that the other person knows they have the upper hand and that your message has been unsuccessful. This asymmetry in the face is often seen when the facial expression the person is displaying is at odds with how they actually feel; something that's really useful to know if we've just delivered a verbal message to someone we want to influence. As with any type of non-verbal communication, this comes with a bit of a health warning. Without a good baseline of how someone usually acts, we can draw false conclusions. Some individuals' 'normal face' may appear asymmetrical. "When distinguishing among smiles, both scientists and laypeople have tended to focus on true and false smiles," said Paula Niedenthal, a psychology professor at the University of Wisconsin-Madison. "The belief is that if you smile when you're not happy, the smile is false. But people smile in many different circumstances and during many emotional states. So asserting that only smiles that result from states of happiness are 'true' smiles limits our understanding of this important facial expression."